A friend of mine once took a youth ministry position at a church and as he settled in, putting books on his shelves, the senior pastor asked him if he had any good books on church leadership. My friend offered, “A Theology of Church Leadership” by Larry Richards. The senior pastors reply, “I was looking for something more practical than theology…” A little piece of my friend died in that moment. Somewhere along the line we hit this gap between the stuff that is true and the stuff that works in pastoral ministry. 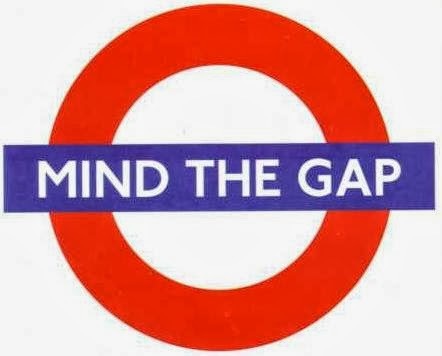 I can’t point to the exact time or circumstance because they are different for each one of us but mind the gap because we all come across it. In Bible College, we had one dear brother who taught his Practical Ministry classes that you can never be friends with the people in your congregation; your friends will be other pastors/ministers. It’s just easier that way. I've listened to many messages preached by pastors whose theology holds that we are saved by grace through faith alone who also berate their congregations or twist the guilt screws about tithing, gossip, volunteering- because it works. Man is a giddy thing. Here are some quotes from references on my thesis topic. Along with the words that are helping me sort out what pastoring is all about, are my own comments about the book, the author or the points they are making. In all these cases, I frequently observe the gap between what we know and what we do. The Christian Pastor by Wayne E. Oates, Westminster, 1982. “Many are the tasks into which circumstances press the Christian pastor, but he thinks of himself at his best as being a shepherd of his flock, a minister of reconciliation whose task is the care and cure of souls in the face-to-face relationships with individuals.” He then goes on to break down the “Pastoral Task” like this: The Crisis Ministry of the Pastor, The Symbolic Role of the Pastor, The Personal Qualifications of the Pastor and The Identity and Integrity of the Pastor. I have to admit that his outline seduced me at first glance and as I’m getting in to the book itself I’m developing a relationship deeper than the initial seduction promised. Ultimately I think this is the book I wanted to write. Contemporary Images of Christian Ministry by Donald Messer, Abingdon, 1989. “In his play Zalmen or the Madness of God, Wiesel struggles with this prophetic understanding of hearing and obeying the voice of God. It is to speak the truth in love even when silence is the better path to survival.” And this, “Critical to the process of accepting God’s gift of ministry is to move beyond the stereotyped images that we encounter, create, accept, internalize or perpetuate.” The chapter these quotes are pulled from is titled, “The Divine Madness of Ministry.” That would have been enough to get me to buy the book but the chapter starts with quotations from two of my favorite authors, Garrison Keillor and Eli Wiesel. Keillor’s quote is from A Prairie Home Companion and it starts the chapter, “You’re only human, even if you are a minister. But if you stand up in the pulpit and say that, the first thing people in the congregation will think of is adultery! And the second thing is “with whom and when?” That’s gold right there! Working the Angles by Eugene Peterson, Eerdmans, 1987. “I don’t know of any other profession in which it is quite as easy to fake it as ours.” And this, “It is an image thing…you discern what people expect and fit into it.” Indeed. This book still cleans my clock every time I read it. Last year, about this time, a friend shared an article with me from the business world. The point of the article was that business leaders often found themselves in a dilemma. They recognized their system was broken, could even describe exactly what was wrong and what it would take to fix it but things were moving so fast at the speed of life that they couldn't stop keeping the day to day going long enough to implemented the course corrections needed to get their company back on track. A systemic shut down, rather than tweaking, was the only way to get a different ending to the story they found themselves in. I wonder if pastors are in that same situation. We see the things that need to be done but we've got this list of weekly stuff that has to get done or the wheels will come off. Expectations, both internal and external, drive us and we see what needs to be done but stuff it in the closet in favor of what has to be done. In a family system, when one member chooses to stop playing by the dysfunctional rules that are making everyone else sick or in pain, they are rarely applauded, rather they are attacked for upsetting the system, the equilibrium, the status quo. I wonder how many pastors have stopped pastoring in order to maintain their job? How many of us have given up our vocation in order to keep our career? Hi, I’m Debbie Downer, and I can’t see the pony, all I can see is a load of poo. I’m not down about my church or my vocation. Seriously. But my thesis project has me thinking and asking myself questions about this thing we do, called pastoring and this thing we are, called pastor. I stand on the shoulders of giants to find answers. What do you think? Do you see a gap between the stuff we know is true and the stuff we do because it’s practical? Thanks for including me in your blogs on pastoring. I find your struggles around what you are reading and thinking challenging and encouraging. I hope more pastors are struggling as you are since the struggle indicates spiritual and vocational health. Not struggling, to me, is a sign of capitulation to the demands of the job, and losing the calling to spiritual and faith-filled vocation.